When it comes to picking Italian food favorites, the list can be endless. At Cannoli Kitchen, we take pride in cooking some of the best Boca Raton Italian food out there. From lasagna and pasta bolognese to pizza and cannolis, we have all of the Italian classics. An Italian favorite, lasagna originated in Italy during the Middle Ages from the city of Naples. The first recorded lasagna recipe was written down in the early 14th century in an ancient Italian cookbook, making it possibly the oldest known form of pasta. 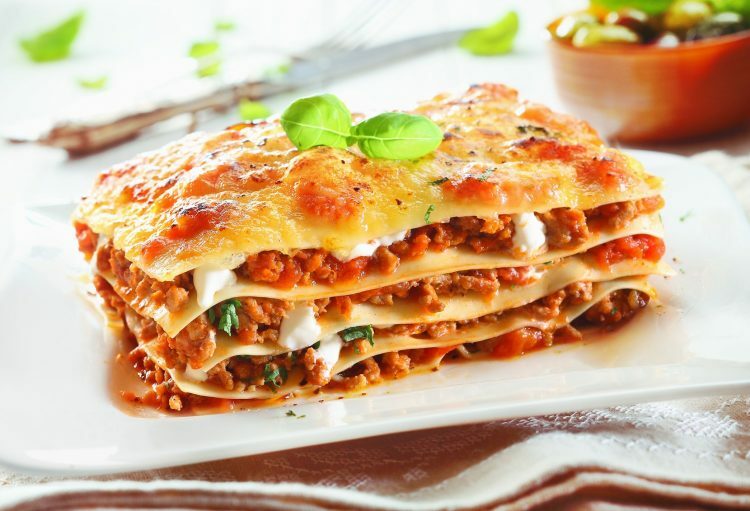 There is a theory that the word lasagna or lasagne may come from the Greek word “laganon”, which means a flat sheet of pasta dough cut into strips. Our delicious lasagna is baked to perfection and made with a homemade ground beef meat sauce and ricotta cheese. Another Italian classic, bolognese sauce, which in Italian is called ragu, is a meat-based sauce that has its origins in Bologna, Italy. The first written record of pasta bolognese appears in a cookbook published in 1891. Cannoli Kitchen’s pasta bolognese has one of the best homemade meat sauces served with traditional tagliatelle. The earliest mention of ravioli can be found in letters from a merchant of Prato in Tuscany, Italy, in the 14th century. Traditionally, ravioli was made at home and the filling varied depending on the area they were prepared in. Our traditional lobster filled ravioli is served with a tomato cream sauce and diced shrimp. Pasta Salssice, also known as “ragu alla Salsiccia”, is a tomato-based meat sauce cooked with sausage and served with pasta. At Cannoli Kitchen, we make our pasta Salssice with sweet Italian sausage, sauteed onions and peppers in a tomato cream sauce served over rigatoni. Capellini literally means little hairs in Italian and is a very thin variety of Italian pasta. It is often presented in a nest-like shape and has been popular in Italy since the 14th century. Our Capellini Pomodoro is a classic made with angel hair pasta, fresh tomatoes, basil, and tomato sauce. If you are looking for the best Boca Raton Italian food, then try one of Cannoli Kitchen’s Italian classics. Whether you are ordering for delivery, takeout or using our excellent catering services, we make all of our Italian food with the highest quality of ingredients. Try one of our classic Italian dishes by calling 561-955-8880.